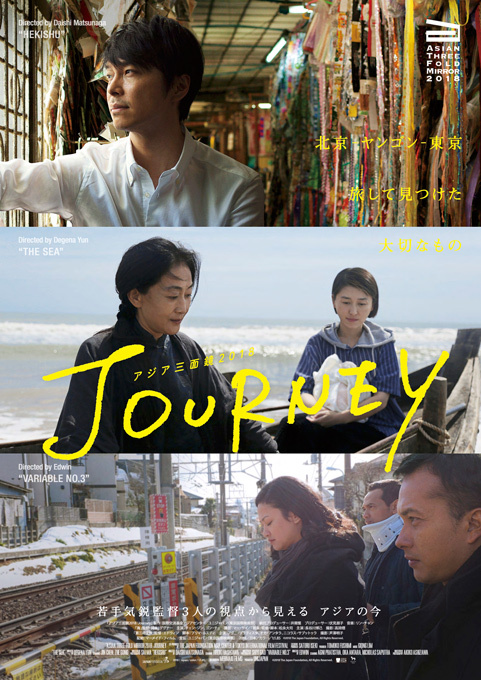 "Asian Three-Fold Mirror 2018:Journey" CO-PRODUCED BY THE JAPAN FOUNDATION ASIA CENTER & TOKYO INTERNATIONAL FILM FESTIVAL EXECUTIVE PRODUCER SATORU ISEKI PRODUCER TOMOKO FUSHIMI MUSIC GIONG LIM "THE SEA" DIRECTED BY DEGENA YUN STARRING JIN CHEN, ZHE GONG DIRECTOR OF PHOTOGRAPHY SAI MA "HEKISHU" DIRECTED BY DAISHI MATSUNAGA STARRING HIROKI HASEGAWA DIRECTOR OFPHOTOGRAPHY SHIYI GAO "VARIABLE NO.3" DIRECTED BY EDWIN STARRING AGNI PRATISTHA, OKA ANTARA, NICHOLAS SAPUTRA DIRECTOR OF PHOTOGRAPHY AKIKO ASHIZAWA DISTRIBUTION MERMAID FILMS PROMOTION UNIJAPAN 2018 / Japan / color / 83min / 1:1.85　©2018 The Japan Foundation, All Rights Reserved. 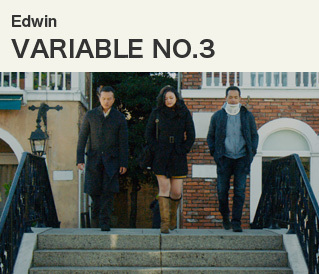 The Asian Three-Fold Mirror project brings together three accomplished directors from Asia to co-create omnibus films with a common theme. The second installment of the series, Asian Three-Fold Mirror 2018: Journey, is directed by three notable Asian filmmakers under the common theme of "journey," signifying travel beyond time and space. Crew and cast joined forces across national borders to depict the lives of characters who journey in China, Myanmar and Japan. One of Indonesia's most popular actors, Nicholas Saputra, appears in all three omnibus episodes. The story revolves around a mother and daughter on the road traveling east to the shore from Beijing. The high-strung mother, chatting on her mobile phone, then chatting to her daughter, then offering passionate prayers to a temple where they stop, is nothing but a nuisance to her daughter, who offers sullen disinterest to whatever her mother says and does. The conversation eventually touches on the recently deceased father and their relatives, resulting in an explosion of anger. So goes the journey, mother and daughter sitting side by side, never making eye contact, but constantly bickering. They soon reach the sea. As they sit in a small boat, their anger seems to have dissipated. What happens next? Japanese businessman Suzuki watches the cityscape passing by as he rides the circular railway that runs languidly through the city of Yangon. With a friendly passenger in the same carriage, he talks about his job, which involves upgrading the railway system to increase speed. When the man asks him why speeding up is necessary, Suzuki answers quite self-assuredly that it will ease people’s everyday lives. After this chance meeting, however, he starts questioning his purpose in coming to Yangon. He buys traditional longyi as a souvenir from a seamstress named Su Su in the local market. Later, he runs into Su Su again, and meets her family. Learning about life in Yangon through his interactions with them, he again questions his job. 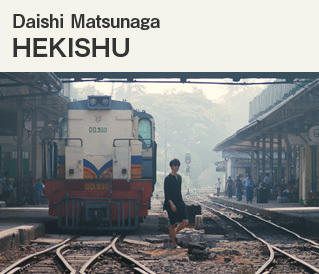 Set in Tokyo, the story revolves around a husband and wife, Edi and Sekar, who have arrived from Indonesia. They roll their suitcases along the streets enroute to a B&B that is owned by Kenji. One look at Kenji startles Sekar, as he is the spitting image of her former lover, Jati. Kenji tells them that he is presently conducting research on contemporary Asian couples and asks for their cooperation. Baffled at the request, Edi and Sekar are resistant at first, but are eventually pulled in, as they now sense that he knows all too well about the problems they’re facing as a couple. Kenji shows them three cards. On the third card we see "Variable No. 3." What does this mean? 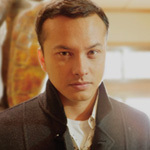 Nicholas Saputra was born in Jakarta, Indonesia. He completed his BA in Architecture at the University of Indonesia. He made his acting debut in What’s Up with Love in 2002, which was the biggest box-office success in Indonesia at the time. The film was distributed across Asia and Europe. Saputra went on to work with prominent Indonesian directors such as Riri Riza (Gie, Indonesia’s official entry for Best Foreign Language Film at the 2006 Academy Awards) and Edwin (Postcards from the Zoo, Berlinale 2012). He was also the face of Chanel V from 2007-2008. In 2017, he co-founded a production company, Tanakhir Films, and is producing a documentary titled Semesta, currently in post-production. 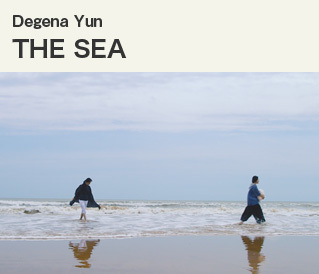 Born in Inner Mongolia, Degena Yun graduated from the University of London and earned an MA in Film Directing from Beijing Film Academy. She made her feature debut with Latitude 52 (2012), which was in competition at the Montreal World Film Festival. With her second feature, A Simple Goodbye (2015), she won the Spirit of Asia Award by the Japan Foundation Asia Center at the 28th TIFF as well as screening Torino, Xining and Minneapolis. 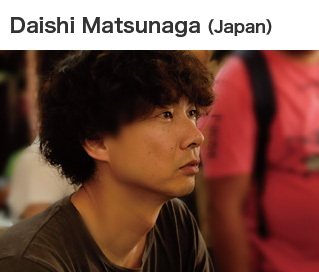 Born in Tokyo, Daishi Matsunaga started his career as an actor and then directed music videos and commercials, as well as a TV series, Rescue Fire. His widely acclaimed documentary, Pyuupiru, was featured in numerous international film festivals including Rotterdam, Jeonju and Paris Cinema in 2011. His first narrative film, Pieta in the Toilet (2015), was a smash hit. Vibration: THE YELLOW MONKEY, a documentary about legendary Japanese rock band The Yellow Monkey, was released in November 2017 and screened at the 22nd Busan International Film Festival and the 30th TIFF. 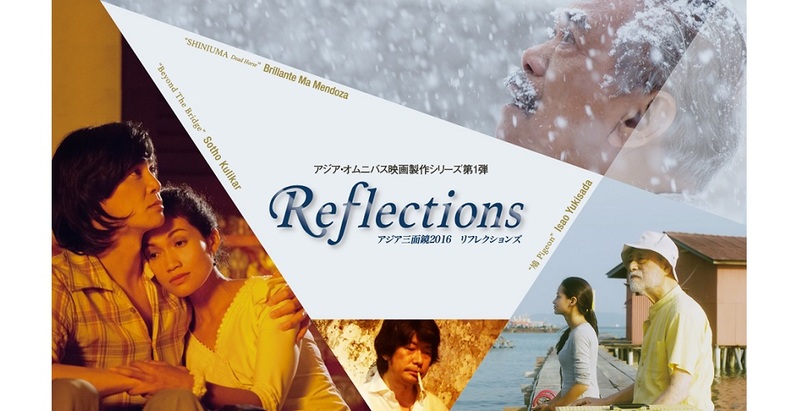 His latest film, Hanalei Bay, released in Japan in October 2018 is based on a Haruki Murakami short story. 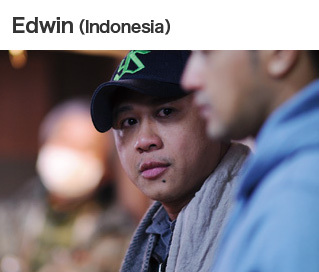 Born in Surabaya, Indonesia, Edwin obtained a diploma in Graphic Design from Petra University and studied film at the Jakarta Institute of Arts, where he liberated his passion for filmmaking, utilizing spontaneous, flexible and fun approaches. His first feature, Blind Pig Who Wants to Fly (2008) received the FIPRESCI Prize at the International Film Festival Rotterdam 2009; and his short film Kara, The Daughter of A Tree (2005), was the first Indonesian film to be shown at the Director’s Fortnight in Cannes 2005. Postcards ｆrom ｔhe Zoo (2012) was nominated for a Golden Bear at the 2012 Berlinale. In 2017, Posesif made a smash hit in Indonesia and won the Best Director Award at the Indonesian Film Festival 2017 (Indonesia's equivalent of the Academy Awards). Born in 1943, Satoru Iseki started his film career at Nippon Herald while an undergraduate of Waseda University. After participating in Nagisa Oshima’s Merry Christmas, Mr. Lawrence (1983) and Akira Kurosawa’s Ran (1985), he established Nippon Film Development and Finance in 1991 and produced Naked Lunch (1991), Howards End (1992) and others. He has produced numerous international film co-productions, including Smoke (1995), The Emperor and The Assassin (1998), The World‘s Fastest Indian (2005) and A Battle of Wits (2006). In 2001, he established HARK inc. There might be a rough and bumpy road to the ocean, sometimes in the midst of chaos. I think they always knew that “an end” awaits them. But it was hard for them to face it. When it comes to death and loss, there is a moment in which the most genuine clarity appears. Nevertheless, on the way to that particular moment, one may experience desire and panic triggered by uncertainty. This is what I think is the saddest part in life - most of the time we are so blind during our journey, while the truth is hidden by an uncertain mind. Only on a few occasions can we express deep compassion to others, from the bottom of our hearts. On my first visit to Myanmar, I was enchanted by its many faces - the circular railway that runs at 20km per hour, people offering their early-morning prayers, jubilant children playing in the streets. But these cityscapes are soon to change as Myanmar undergoes rapid development. What does a society gain from modernization? And what does it lose? What is true abundance? I thought of these questions, and felt that I wanted to preserve on film the Myanmar that could only be captured today. My understanding of being human was built on romanticism, nationalism, myths, and fantasies - anything but the truth. Unable to find the truth, haunted by an unclear past, an unpredictable future, there is no trust. Truth can lead to a series of painful changes. But lies and ignorance contribute to fear. Fear destroys. We seriously need to deal with our past. No matter how awkward the situation is, it’s urgent.